Fifteen years ago today, Windows 95 was released. Many would remember the adverts, which hit TV screens around the world, to the tune of the Rolling Stones’ “Start Me Up”. It was arguably the first modern version of Windows (despite it still apparently having DOS under the hood), and arrived just before the Internet went mainstream, so for many people it and the subsequent versions are what most people became familiar with. 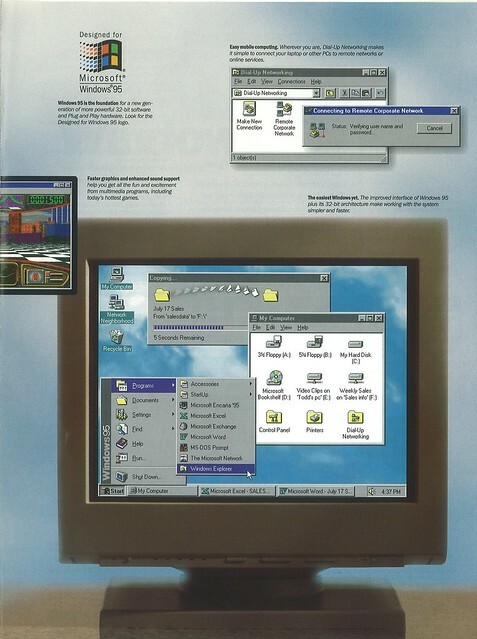 It was certainly the first version of Windows with a Start Menu, and other features such as long filenames (not limited to the DOS convention of eight characters plus an extension), and Plug And Play (allowing you to plug in devices and have the system work out which drivers were needed) — which at the time didn’t work nearly as well as was implied in the literature. Users of Mac and other platforms would argue that Windows was just playing catchup, and that’s probably true, but for those of us in the dominant Windows world, it was a big step forward. I remember the launch day well because part of the hype involved lots of promotion, and via a radio station truck parked outside work, I won a copy. Which was good, because I’d intended on buying it for myself, to run on my mighty new computer, the one with the Pentium 60 MHz CPU and 8 Megabytes of RAM. Note that it promises “pre-emptive multitasking and multithreading”, another feature that wasn’t nearly as good as promised. They promised it again in Windows NT 4 a year later, but arguably it never really worked up to expectations until multi-core CPUs (eg hardware, not software) came along. 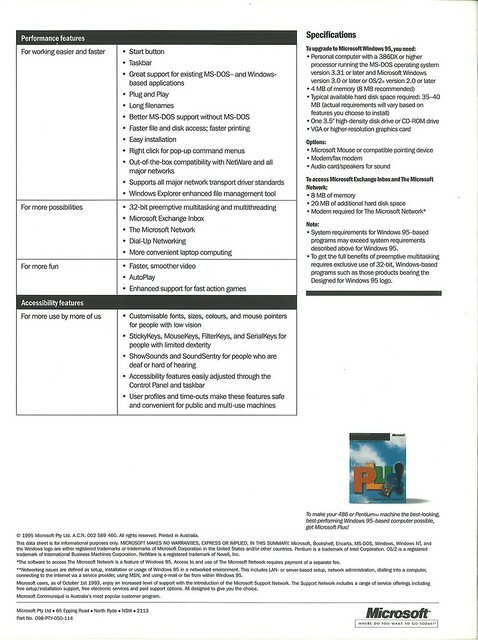 I remember doing my IT diploma at TAFE in 97 and we were still using 3.11. I think there are many advantages to being a part of the IT evolution, today everything is supposed to work out of the box, but in the past there were always fun things to do like setting up your interrupts and memory allocation in the system files. I love Win7 but miss the challenge and satisfaction of the older operating systems, does anyone else remember OS/2 and Novell? Ah, memories. There was a monster Windows 95 sign high up at the corner of Bourke and Swanston Streets. It was very brightly lit and attracted seagulls to feed on the moths attracted to the light. My step-mother started with Windows 3.11. How antiquated that seemed. Yes, I feel old now lol. Heh! And didn’t Bill Gates get a BSOD during the launch? or was that 98/ME? I am packing to move house at the moment and just last night, I threw out my original OEM Windows 95 CD. Figured I’m probably not going to use it again…. Mind you, I still have boot disks on 3.5 inch floppy – why? And on that day, Windows NT 3.1, which was a far more advanced OS, despite having less flashy UI chrome, had already been out for over two years. @shell, yes, he got a BSOD. It’s on Youtube somewhere. @Vas, I think the following year NT4 came out, with a Win95-like interface. I used that for several years at work in preference to Win95. When Win2000 (also based on NT) arrived, I used that at home. Ah the memories. Windows 95 was the system on my first home computer, bought in January 1996. The computer came with a “gigantic 1.2 GB hard drive” !!!!! I kid you not. 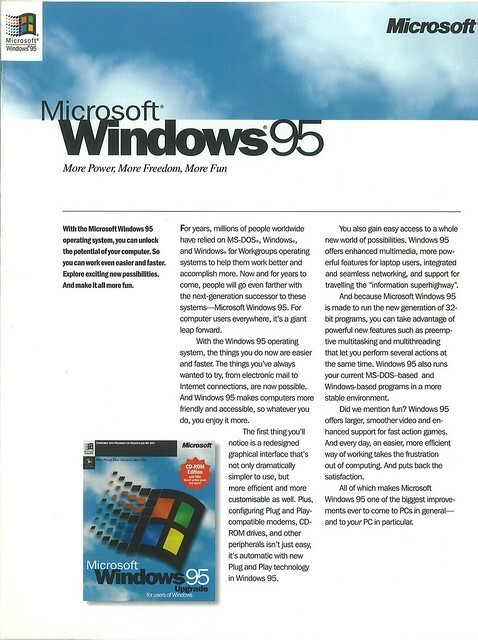 Win 95 did not have a web browser. Gates allegedly had said “this internet thing will never take off” and did not include one. This meant I started on the Net with Netscape Navigator Version 1, yes, Version 1. Though my ISP quickly replaced it with V2. 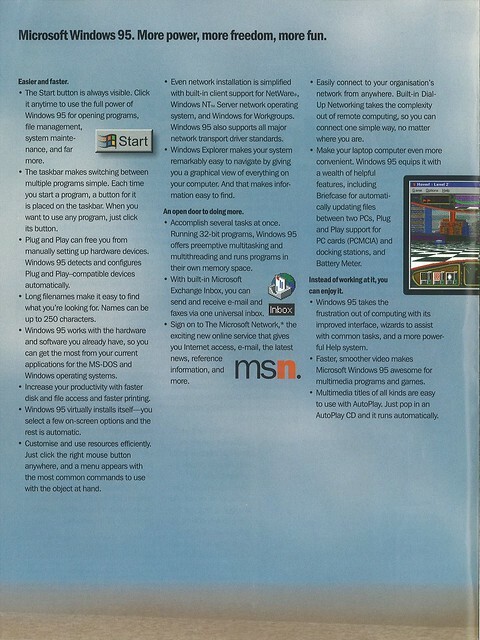 Win95 came with my first MSDN subscription (US$500!). I installed an early beta on a 20 MHz 386 with, as I recall, something like 2MB of RAM. Yesterday I was setting up a Win 2008 Server VM, and reflected on how I still strip the eye candy off until the menu essentially looks like Win 95’s.